This feta appetizer is so easy to make and tastes absolutely delicious. If you are short of time and have guests coming over, this is the perfect appetizer to make in about 5 minutes. It is filling, colorful, and flavorful and fits ideally into a low-carb menu. This is also a tasty way to serve feta cheese and is sure to receive raves at summer barbecues, get-togethers, and family gatherings. I have shared this recipe with everyone because it is such a good appetizer to prepare on any occasion! Cut feta cheese into squares or 1/2 to 3/4 inch cubes and arrange on a serving platter or a large rectangular-shaped plate. As a rule of thumb, 400 grams of feta cheese (14 ounces) yield about 46 - 48 small squares. Rinse olives well under cold running water and then drain. 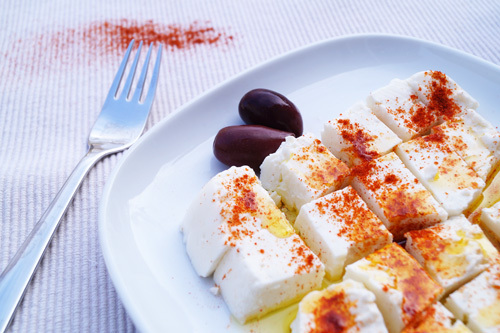 Once arranged on a platter, sprinkle feta with red pepper to taste and drizzle with extra virgin olive oil. Add two whole Kalamata olives on each side of the plate to garnish. Serve as an appetizer with low-carb bruschettas or as a hearty side dish with your main course. Serve immediately and at room temperature.